Shelter Records, an offshot of ABC Records, took a chance when it signed the Heartbreakers in '76. The group responded with an effort which even they hadn't expected. "We were all pretty surprised," said Petty about the success of the first release and the subsequent influx of attention thrust upon himself and fellow members Mike Campbell (guitars), Ron Blair (bass), Benmont Tench (keyboards), and Stan Lynch (drums). "I sort of dug a hole and got down in it. 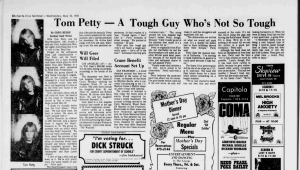 We're still pretty much the same bunch of people," Petty said. The Heartbreakers play rock that vibrates the entrails. Petty has a stern sensitivity for vocal nuances and a daring penchant for downbeat. He writes hard songs with fire and sass, drawing from his own personal experiences. In that crusher of a tune, "Fooled Again...I Don't Like It," Petty screams of sweet revenge. "We pointed at someone," he said. What gets this tough guy (who's not really a tough guy) really upset—tee'd off to the max? "Animated chewing gum commercials." The smog around his Los Angeles digs doesn't bother Petty, though, because "I don't really go out in the daytime that much. It's a good town for us." Petty is originally from Florida, but inevitably he and the Heartbreakers are taken as another British punk band, possibly because of the boyish bad looks and deliquent charm of the soft-spoken Petty. "People make that mistake a lot. Hey, we're proud to be Americans," Petty said with a laugh. Petty believes the punk-new wave has about run its course. The good bands which came out of the new wave, he said, will make it, and the stragglers and exploiters will not. "The obituraries are written on what we would call punk rock. It's a shame the public had to have bullbleep shoved down their throats," Petty said. Petty likes the musical merits of California. "I'm starting to think Caifornia in general is really good because it digs music." The Santa Cruz performance will be one of six stops on a T.P. & H. mini-tour. The band will then return home for a short while before embarking on a longer mission. "We've just started to headline our own tour and we're amazed at the costs. It's not like we're doing the gigs and driving the Rolls home. Money? It's a drag. We'd do it for nothing if we could. All we owe the public is a good performance," Petty said. 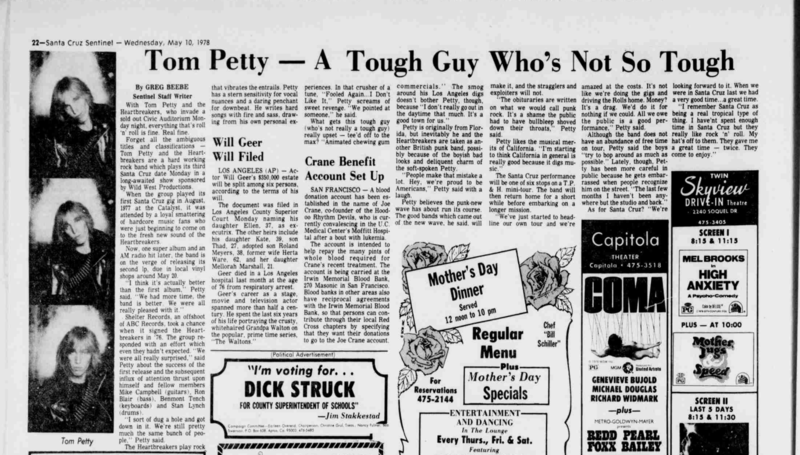 Although the band does not have an abundance of free time on tour, Petty said the boys "try to bop around as much as possible." Lately, though, Petty has been more careful in public because he gets embarrassed when people recognize him on the street. "The last few months I haven't been anywhere but the studio and back." As for Santa Cruz? "We're looking forward to it. When we were in Santa Cruz last we had a very good time...a great time. "I remember Santa Cruz as being a real tropical type of thing. I haven't spent enough time in Santa Cruz but they really like rock 'n' roll. My hat's off to them. They gave me a great time—twice. They come to enjoy."